Maple bacon – the finished product | eat. live. travel. write. According to Mr Neil Master Butcher, it looks to have “cooked” a bit too much versus “smoked”. Apparently you can freeze bacon for a few months…just in the fridge it would only be good for a couple weeks, so that’s what I’m planning to do. However if it’s a bit too cooked, that makes me a bit leery? Anyone have an idea here? So I thought I had better slice some up for freezing…it looks good. Can only cut THICK slices (Editor’s note – suuuuuuuure you can). Also saved a “chunk” fro freezer. 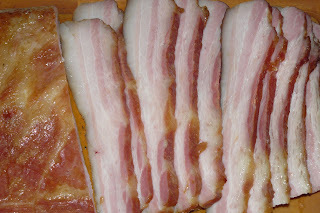 Mmmmmmmmmmmmmmmmmmmmm…bacon! That looks very tempting @ 80% fat distribution! Oh I am ALL for the natural fats….